for Group B, C, D & E Employees. call us today- it's that easy! 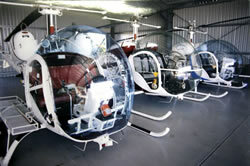 Since 1990, Blue Tongue Helicopters have built a reputation as one of Australia's leading helicopter flight training specialists. We aim to provide a professional, high quality service with a focus on your future employment. Many of our past students are now operating their own successful helicopter companies and are happy to call us looking for a pilot. Our highly experienced pilots will tailor your needs whether you are looking for a spectacular scenic flight over the Sunshine Coast or in for the long haul - training for a Private or Commercial Licence, endorsement, renewal, upskilling or just a cup of coffee and a chat on the deck. At the moment there is a lot of confusion regarding training costs since the new Part 61 regulations were introduced September 1, 2014. Blue Tongue still operates under the previous sylllabus of training. This means that all Commercial courses will still be a 105 hrs and Private courses @ 50hrs. We have endeavoured to keep up to date with these changes and offer what advice we can to both student pilots and qualified pilots. More changes appear to be coming as CASA realises the massive effect Part 61 has made on the Helicopter Industry. The school consists of a CASA approved, air conditioned Office Building and Student Classrooms as well as a separate hangar for aircraft storage. The verandaha's are spacious with relaxing tropical gardens surrounding the main building.